The newly completed, 10-story LEED® Platinum building is constructed mainly of glass. This provided CORE the opportunity to suspend a can’t-miss-it piece that draws attention to the interior from both inside and out. Let me introduce you to “Promises Promises”: a relevant design from a story-telling and aesthetic perspective. The light fixture is comprised of 270 wave pattern strips built from frosted acrylic that resemble a flock of birds in full animation. Amongst the abstract elements, we suspended 62 solid glass balls lit with LEDs which contributed to the sustainability requirement of the project. The goal of the design was to create a continual sense of motion, buoyed by an equally serene sense of space. The feature installation was special in the fact that the space had two different ceiling heights. 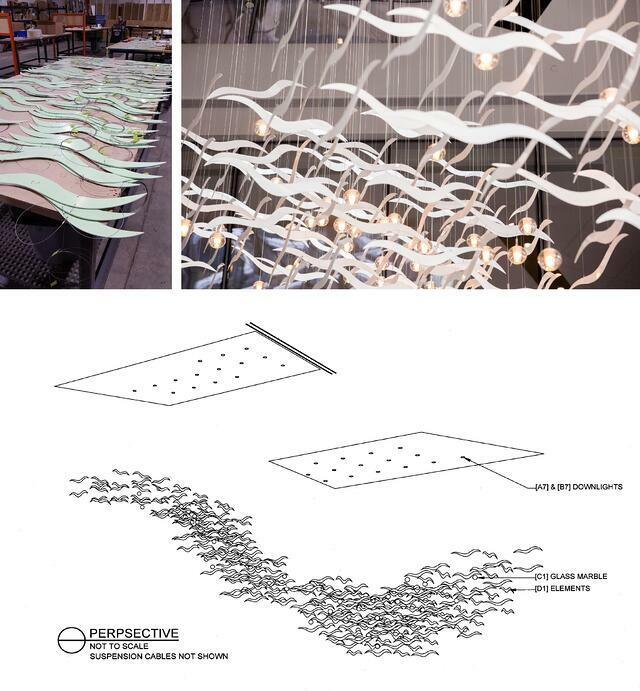 We designed separate canopies and suspended the elements in such a way that they formed one fluid sculpture. Coordination and attention to detail was no joke on this one, folks! The mirrored finish on the ceiling plates create sparkle and illumination for an additional ‘wow’ moment. 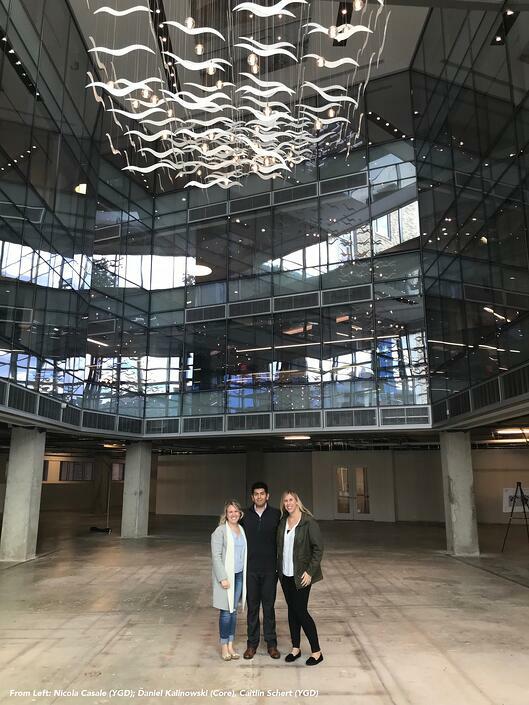 Our main collaborator at CORE, Daniel Kalinowski, Associate AIA, was gracious enough to offer a tour of the space to myself and Caitlin Schlert, YGD’s Project Manager. Check us out below! A huge thanks to Daniel and his team for including us in this spectacular and innovative project. Looking for a design partner that will design, fabricate AND install an original sculpture for your space? Give us a go- we PROMISE you won’t be disappointed.